This is a guest post by Site Trail.com. If you want to guest post on this blog, check out the guidelines here. The web is filled with a ton of website analytics services such as Alexa, Compete, and Quantcast. However, all of them face one huge problem. They provide inaccurate statistics based on information collected from users who use their self-branded toolbars. This makes it very tough for website owners, including webmasters and internet marketing professionals, to understand these site stats. No real value is obtained from these metrics beyond simple trend observations. A new startup in town called SiteTrail tackles this issue by taking an entirely different approach to reporting site analytics. SiteTrail scours the web in an attempt to find as much information as it possibly can about any given website or domain name. Then it compiles easy to understand reports that are accurate down to the number allowing webmasters and enthusiasts to see quick snapshots of their favorite (or competitor) websites. All you have to do is provide the website analysis tool with a website domain name and viola. You can also use the tool’s Chrome, Firefox, or Internet Explorer browser extensions to perform site lookups. The tool then performs a site analysis of numerous different metrics divided into individual blocks on a single web page so that they can easily be deciphered. • Social Media Analysis – From Twitter followers to Delicious bookmarks, find out how popular a site is in the social media space. • SEO Analysis – Learn how well a site is optimized for popular search engines such as Google, Yahoo and Bing. 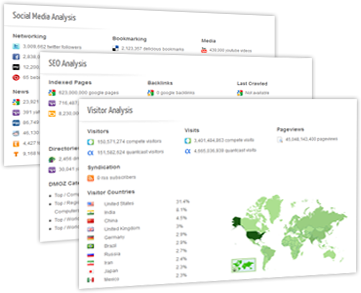 • Visitor Analysis – Get an estimate of how many people visit a site from popular web analytics services such as Compete and Quantcast. • Traffic Analysis – Learn about a site’s traffic patterns and how well it ranks on services like Alexa and Compete. • Revenue Analysis – Determine how much advertisement revenue a site can make at the current economic conditions. • Content Analysis – Analyze the top keywords a site is using and determine other factors such as it’s average page size. • Link Analysis – Find out who a site is linking to and how much “link juice” it passes to them. • Hosting Analysis – Find out a site’s IP address and server location as well as which web hosting company is hosting it. • Domain Analysis (WHOIS) – Monitor a site’s domain name, find out who it’s registered to, when it expires and more. • Server Analysis – Learn what software a site was built with, how fast it’s web pages load and the programming languages it uses. • Color Analysis – Get a quick snapshot of the top colors used on a site including respective hex codes and color densities. Additional features include DNS record analysis, HTTP header analysis and much more. The plethora of information this tool provides makes SiteTrail the ultimate all-in-one website analysis tool. Nice post, Vincent! Now, i can analyze my traffic and my site better. Thanks for sharing the post. Interesting post. Check out this one, looks great and promising. lionyzer is still beta, so not so many people know about it. diploma to enter into a specialized dental assistant training program. Most will show you as much as they can when it is appropriate to do so. diseased artery, causing a heart attack.